June 1, 2014 0 comments on "DIY Mason Jar Centerpieces"
Mason jars are very trendy right now. Inexpensive and easy to find, mason jars are very versatile and are being used for a variety of decorative purposes for parties, wedding receptions, and more. Here are just a few creative ideas for using mason jars as centerpieces for your next party or reception. Perhaps the most simple use for a mason jar is using it as a vase for fresh flowers. They can be used singly or in groups. If you group them together, try using jars in a variety of heights for more visual appeal. Some people use wide ribbon or strips of burlap to tie together groups of two or more jars. Most craft stores now have strips of burlap that come on rolls that you can buy to tie around wreaths and jars such as these. You can place just about any kind of short-stemmed flowers in these vases. Lilacs, tulips, and daffodils would look beautiful for spring weddings. Just cut the stems down to fit in the jars. Daisies and roses would look great for summer weddings. Another option is to fill the jars with baby’s breath and wrap lace ribbon around the jar for accent. Mason jars look beautiful with votive candles in them. You can also place these jars together in groups, or mix them with the mason jar vases. Maybe group together one of each. Or group three or four mason jar candles holders down the center of a long table. Add seasonal greenery to accent the candles, such as forsythia branches for spring, fall leaves and pine cones for autumn, or pine branches and holly berries for winter. If you want to customize your jars to match the color scheme of your party or reception, then consider adding glitter to the jars. All you need for this project are some mason jars, bottles of glitter, and Pledge Floor Care cleaning product. Some ingenious person figured out that glitter will stick to Pledge Floor Care. It is a pretty neat trick. Set your supplies out on some newspapers because this might get a little messy. Next pour a small amount of Pledge Floor Care into the jar and roll the jar around until the liquid completely coats the inside of the jar. Dump out any extra liquid. Next pour the glitter of your choice into the jar and swirl it around until it completely coats the inside of the jar. Dump out any remaining glitter. Set the jar aside until it dries. These jars turn out very sparkly and would be a great addition to any bridal shower or wedding reception. Tinted jars are a little different from the glitter jars. Glitter jars would make great vases, but they are not transparent. If you want to be able to see through the jars so that you can use them for candle holders, then consider tinting the jars instead. This method will permanently tint the jar. All you need are some mason jars, transparent glass paint, and a sponge brush. Coat the entire inside of the jar with glass paint in the color of your choice (turquoise is a popular choice), starting at the bottom and working up to the top. Use one coat for lighter tints, and two or three coats for darker tints. After you have finished painting let the jar dry upside down so that any excess paint drips out. Let the jar sit out for two days. After two days, place the jars on a cookie sheet in the oven at 200 degrees F for thirty minutes. DO NOT preheat the oven. Place the jars in the oven while it is still cold. When they are done baking, turn off the oven and let the jars set in the oven until they are cooled off. These jars are just beautiful. People won’t believe you made them yourself. If you are planning a wedding or wedding reception and are looking to cut costs, then making a lot of your own decorations will really help save money. 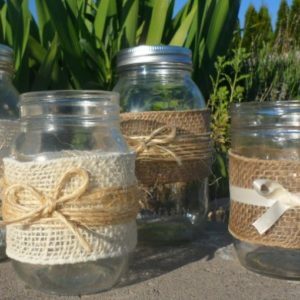 These mason jar centerpieces are very easy to make and elegant looking too. People will never know you didn’t spend a fortune on them. Follow my weddings board on Pinterest.